Witching Waves (Emma Wigham, batería; Mark Jasper guitarra y Estella Ardeyi bajo) se formaron en 2013 como un dúo incluyendo a Emma y Mark después de la separación del anterior grupo de Emma, Weird Menace (con quienes también estuvo Mark en su última etapa). Su sonido post-punk DIY ha sido comprado con Sonic Youth, Pixies o The Vaselines. Se estrenaron con un EP homónimo (Suplex Cassettes, 2013) seguido de otro single en casete en Soft Power records a principios de 2014 (“Concrete”). El primer disco de Witching Waves, “Fear of Falling Down” (Soft Power Records, 2014) mostraba un perfecionamiento de su sonido pero sin perder la filosofía lo-fi de los anteriores trabajos. Ese mismo año se convirtieron en un trio con la incorporación de Ed Shellard al bajo. A continuación publicaron otra casete publicada junto a As Ondas, en la que cada grupo hacía versiones del otro, y un EP split con nuevas canciones para acompañar a una gira conjunta por el Reino Unido con Rattle. Su segundo disco “Crystal Café” (Soft Power Records, 2016) se publicó también en EEUU con el sello HHBTM Records y vino seguido de una gira por EEUU y Europa (incluyendo el Indietracks). Estella Adeyeri (miembro de Junk; anteriormente en Dirtygirl) se unió a Witching Waves ese año, sustituyendo a Shellard en el bajo. Witching Waves (Emma Wigham on drums; Mark Jasper on guitars and Estella Ardeyi on bass) formed by Emma and Mark as a duo in late 2013 following the dissolution of Emma’s previous band Weird Menace (Jasper had also joined in its final incarnation). 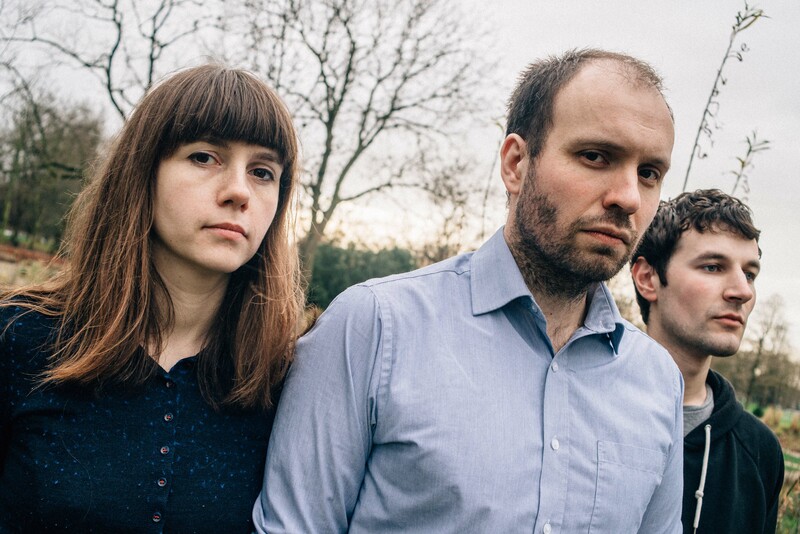 Their DIY post punk sound has been compared with the likes of Sonic Youth, Pixies or The Vaselines. They debuted with a self-titled EP (Suplex Cassettes, 2013) followed by another cassette single on Soft Power records in early 2014 (“Concrete”). Witching Waves’ first album “Fear of Falling Down” (Soft Power Records, 2014) that saw them perfecting their sound without levaing their lo-fi approach behind. That same year they became a trio with the addition of bassist Ed Shellard. Their next releases included another cassette EP issued as a joint release with As Ondas, including each band versioning one of the other band’s songs and a split EP of new material, released to mark a joint UK tour with Rattle. Their second LP “Crystal Café” (Soft Power Records, 2016) was also released in the US by HHBTM Records, and short tours of the US and Europe followed (including Indietracks). Estella Adeyeri (also of Junk; previously of Dirtygirl) joined Witching Waves the same year, replacing Shellard on bass.